Complete your white card, learn about safe work practices, work effectively in the construction industry and handle tools and equipment specific to the bricklaying/blocklaying or carpentry and joinery trade throughout this 15 week course. Gain practical skills and utilise your knowledge on-site during work placement opportunities. We have employers actively seeking committed, reliable and hardworking apprentices who want to be part of the bricklaying/blocklaying or carpentry and joinery trade. Commencing a pre-apprenticeship course can be the first step towards your career in the construction industry! Course Structure: 15 weeks. 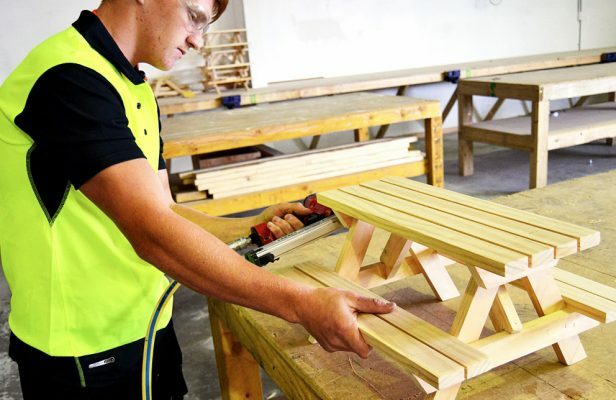 Monday to Thursday at the Skill Hire Forrestfield Training Centre. Attendance: Monday to Thursday 7.30 am to 3.30 pm Training commences at 7.30 am – students must be onsite and ready to commence at this time. A MINIMUM DEPOSIT OF $200 OR FULL PAYMENT MUST BE RECEIVED PRIOR TO COMMENCEMENT OF THE COURSE TO SECURE A PLACE. A MINIMUM DEPOSIT OF $300 OR FULL PAYMENT MUST BE RECEIVED PRIOR TO COMMENCEMENT OF THE COURSE TO SECURE A PLACE. A MINIMUM DEPOSIT OF $400 OR FULL PAYMENT MUST BE RECEIVED PRIOR TO COMMENCEMENT OF THE COURSE TO SECURE A PLACE. If a deposit is made, the remaining fees will be required WITHIN 8 WEEKS of commencing training. Refer below for full indicative fees. The student tuition fees are indicative only and are subject to change given individual circumstances at enrolment. Additional fees may apply such as student service and resource fees. For incidental charges refer to Skill Hire WA’s student handbook which outlines Skill Hire WA’s fees and charges policy. This training program is funded by the Western Australian Department of Training and Workforce Development.